Badges are not guaranteed to be delivered before any convention deadline. READ THE T.o.S. before ordering! So what is your hashtag? Each Hashtag themed badge comes with the following customization options & features! Unique ID# for Re-Ordering Badge in case it get's lost. Pick any hashtag you want and we can draw up your fursona image to match! Expressions and poses of character can be anything! Photo is colored with highlights and shading. Back of badge matches badge color up front! Badge is laminated and sent with it's own badge clip! 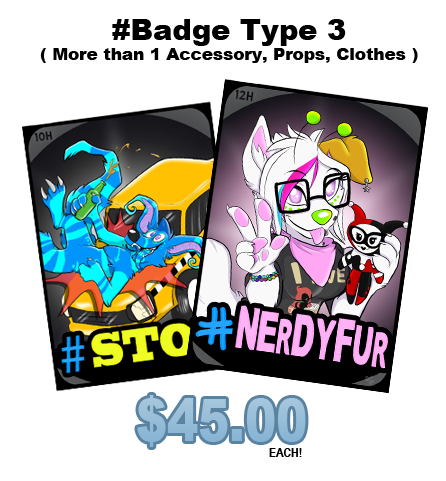 Coming soon - Premade #Badges!